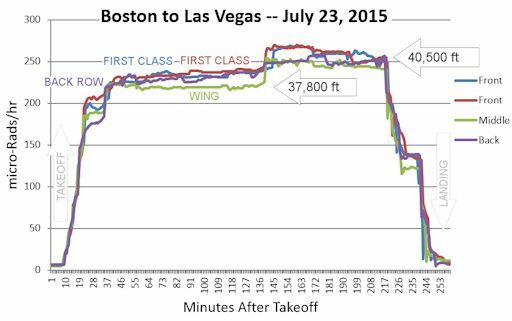 Radiation levels in the cabin of the Airbus 319 (Spirit Airlines flight 640) tripled within ten minutes after takeoff, and were nearly 30 times ground level by the time the plane reached cruising altitude at 39,300 feet. Summing over the entire flight, the sensors measured about 1 mrem of radiation–similar to a dental x-ray. There was no solar storm in progress. The extra radiation was just a regular drizzle of cosmic rays reaching down to aviation altitudes. This radiation is ever-present and comes from supernovas, black holes, and other sources across the galaxy. The Earth to Sky team consisted of five people who sat in three different locations: First Class, over the wings, and in the back row. Would they all absorb the same dose? No. 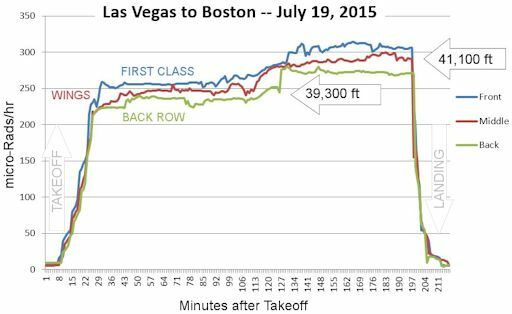 On this particular flight, dose rates were highest in First Class and lowest near the toilets in the rear. The front-to-back ratio was as high as 13%. This gradient is not understood; presumably, it has to do with the way cosmic rays interact with the plane’s fuselage and fuel tanks. As before, the First Class seats registered the highest dose of radiation–as much as 6% higher than the wings and rear of the plane. On this flight we added a second radiation sensor to First Class to confirm the effect. Both sensors agreed: ionizing radiation was slightly higher in the front of the plane. 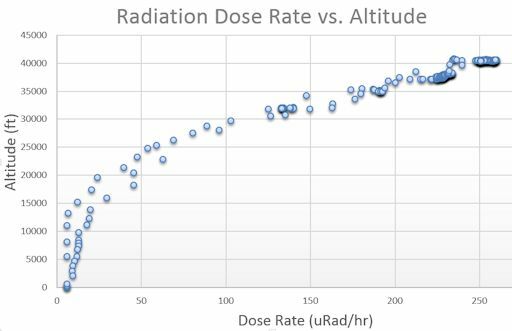 Note how radiation levels remain low at altitudes below ~15,000 ft. Earth’s atmosphere does a good job shielding those altitudes from cosmic rays. Above 15,000 ft, however, dose rates climb rapidly as the plane ascends. The radiation sensors are the same ones that Earth to Sky Calculus routinely flies onboard helium balloons to measure cosmic rays in the stratosphere. They detect X-rays and gamma-rays in the energy range 10 keV to 20 MeV. These energies span the range of medical X-ray machines and airport security scanners.